Despite their wonderful nature, it is important to realise that as a puppy they can easily knock down a young child and supervision must be maintained. They can get over excited, like any puppy, and damage can easily be done unintentionally. Newfoundlands are people dogs. They will never do well away from their family, outside in a kennel. They will follow you about all over the house, will be in front of the cooker when you are trying to cook, will be next to you when you are sitting at your desk. And they love to lean on people! This can be a very endearing trait, but remember how heavy they are when they decide to lean against someone who is a bit fragile. They also like to give a paw, and this is not really something that you want to encourage. My arms used to be covered in bruises, simply where Ferdie had given me his paw. These dogs drink vast amounts of water and they like to sleep outside in the evenings, especially in the summer. They will get very frustrated if they cannot do this, so a home with no garden is definitely unsuitable. Newfoundland dogs will normally need little in the way of loose leash training, as it is not in their nature to pull on the lead. However, every dog is different and they can still pull you along if they see something they want, so a certain amount of training is essential. Basic training is essential, and it is important to know the breed traits of these beautiful dogs to achieve that. 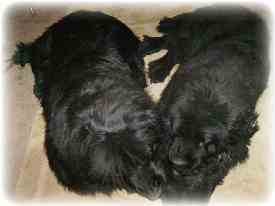 These dogs need very little exercise, especially when they are growing. They are not a dog who is going to go jogging with you, or run along beside a cycle. They are quite happy to sleep all day, if you let them, but that is not a good idea. They need socialisation, and early socialisation is essential. 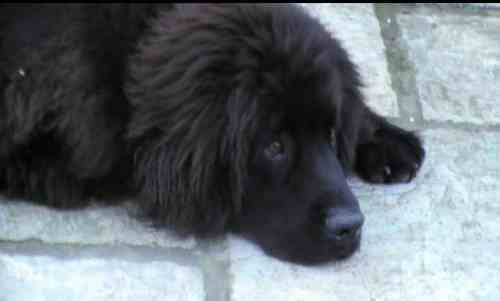 You may have noticed that people with newfies rarely have just one. Most have two, some have more than two. My reason for having two is simple - Ferdie needed someone his own size to play with. This breed loves other dogs, provided they have been introduced to them early, and they play best with dogs their own size. You will not see many of those. My two are devoted to each other, they do not enjoy going for walks without each other and they lie on the floor licking each other's noses! The best thing I ever did for Ferdie was to get Joshua. Grooming a Newfoundland Dog is a major occupation. I actually came across a dog information website that stated that a newfie only needs an occasional brush! Yeah, right! If you don't want to have to cut out matts from all over the body, his coat needs a lot of work. Be sure to check out the breed standard and avoid paying lots of money for "rare" colours. Of the Newfoundland dog facts that pleased me the most when I started my research, is that their lifespan is much longer than most other giant breeds. Their average lifespan is between twelve and fourteen years, the same as any other large dog breed, whereas a lot of giant dogs do not live to be more than 9 or 10 years old. St Bernards have an average lifespan of only 5 to 7 years, which is heartbreaking. With the right food and care, you can look forward to having your newfie with you for a very long time. The Newfoundland is a very ancient breed, whose history goes back to the times of the Vikings.